The Director Generals Military Operations of each country met for the first time in 14 years. India and Pakistan look to be in for a calm new year on their disputed border in Kashmir – the Director Generals Military Operations (DGMOs) of each country, among the highest military officials, met for the first time in 14 years to “discuss ways to ensure peace along Kashmir’s de facto border,” according to the BBC. According to The Times of India, Lieutenant General Vinod Bhatia is leading the Indian delegation and Major General Aamer Riaz is in charge for Pakistan. 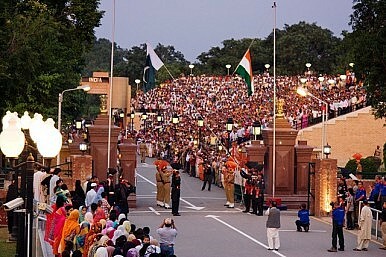 The two sides met on the Pakistani side of Wagah, the only road border crossing between India and Pakistan. The Wagah meeting was described as “positive” by both sides – a sincere statement in all likelihood given the content of the joint statement. Military-to-military contact between India and Pakistan is rare and could help in preventing misunderstandings of the sort that lead to skirmishes along the LoC, increasing tensions on both sides. According to The Hindu, the Indian side “used the opportunity” of the Wagah meeting to ask the Pakistani military to clamp down on militant infiltrators from the Pakistan side. The Indian strategic establishment has well-founded concerns that the Pakistan military and its Inter-Services Intelligence (ISI) agency foment unrest in Indian Kashmir by abetting the passage of militants across the LoC. The Indian army maintains a huge military presence along the LoC, with around 15 brigades on constant patrol duty. In general, militancy has declined in Kashmir since 2010, but the uptick in military skirmishes in 2013 necessitated a consultation of the sort at Wagah. As I noted in my retrospective on 2013 in India-Pakistan relations, the year wasn’t particularly positive – marked by skirmish after skirmish along the Line of Control (LoC). While both Prime Ministers Singh and Sharif expressed their interest in pursuing peace, legislators in both India and Pakistan issued resolutions condemning the other over its behavior in Kashmir. India and Pakistan have fought three conventional wars over the disputed territory and domestic resentment remained high in each country, amplified by the events of 2013. It remains to be seen if the Wagah meeting is an isolated and rare occurrence, intended to clear the air between the Pakistani and Indian militaries after a trying year, or if it can generate some momentum that could ease the path for comprehensive talks regarding the state of the LoC and Kashmir. India’s options after Pulwama are various, each with their costs and benefits.